"Have feet" cracked me up. I can vouch for the Pit method. 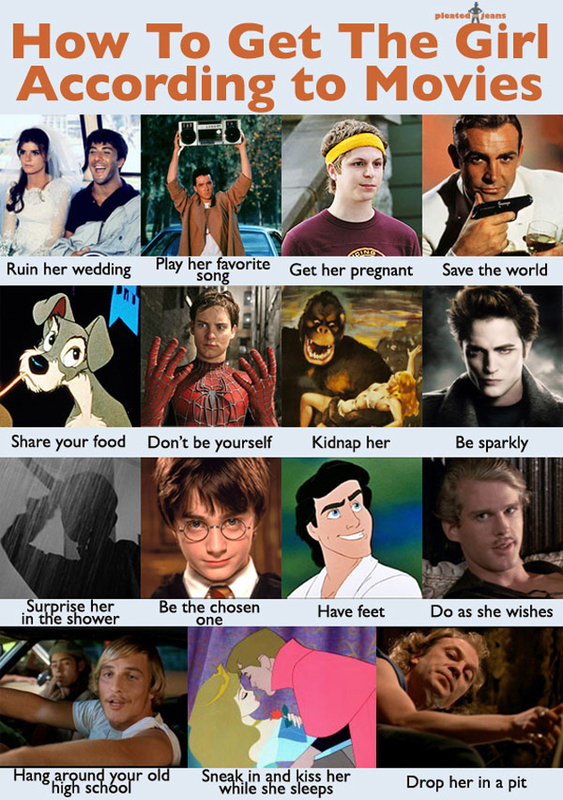 I think a combination of surprise her in the shower, kidnap her, drop her in a pit, work quite well together. Being yourself just isn't interesting enough for feature film material. Or most real women, for that matter. kill her 7 evil ex boyfriends? They're not real if they don't enjoy reality. At the moment of reading this, The Princess Bride began. This keeps happening to me today. I agree with play her favourite song. If he knows my fav song, then he knows me. What movie is the "ruin her wedding" from? Does anyone know? Why did I think of Gaston? nooo. Easy A copied that part, referencing that act from the movie Say Anything :) with John Cusak, which is where that picture is from. What's the surprise her in the shower one? one is sharing information, that's in fact fine, keep up writing.